Wondering what the 5 Shades of Gold Jewelry from Gray and Sons are, Hallandale? In the creation of fine jewelry, there are several metals that are used. When you have enough knowledge about various metals, you will be able to make more informed jewelry purchasing decisions. To make jewelry, the types of metals used commonly include platinum, gold, silver, titanium and stainless steel. With jewelry, metals that include palladium and rhodium are also used. When it comes to engagement rings and wedding rings for men and women, gold is the most popular choice. It is also very popular in bracelets, necklaces, pendants, earrings and dress rings. Aside from considering which carat of gold to use, another considering would be what color of gold suits you best. Basically, there are 5 shades of gold jewelry at Gray and Sons including yellow gold, white gold, rose gold, gray gold and green gold. The only color of gold in its natural state is golden yellow. In the jewelry featured in Gray and Sons, this is the most common gold type used. The difference between rose, white and yellow gold depends on the alloy mix in the metals used. Since yellow gold results from the alloy mix in the metal components, the yellow gold color does not wear off, fade or chip with age. Yellow gold is created by mixing alloy metals like zinc and copper with pure gold. The next most popular kind of gold is white gold. White gold is created by increasing alloys such as nickel, silver and zinc and decreasing the alloys that are yellow in color, which is usually copper. Although it is nearly white in color, fourteen carat white gold contains as much gold as the yellow variety. Unless it is plated with rhodium, white gold still has a faint yellow hint. Also known as pink gold, rose gold has a very delicate, subtle color that tends to intensify with age. There are various intensities of rose gold pieces at Gray and Sons. In addition, depending on what light you are looking at the rose gold jewelry, such as fluorescent light, incandescent light or natural light, you will notice that the pink color will show up differently. Before you order your jewelry, make sure you are familiar with the rose gold color. The way this shade of pink gold is created is by increasing the alloys with copper color normally found in gold and lessening the alloys with a silver color. Although slightly more pink in color, rose gold does contain as much gold are regular fourteen carat yellow gold. You will find a more pronounced rose color in fourteen carat rose gold compared to its eighteen carat counterpart. Alloys of gray gold are made from palladium and gold mixed together. At times, copper, manganese and silver are added in certain ratios to yellow gold to create gray gold. Also called electrum, green gold is an alloy of gold and silver that naturally occurs and has been known since 860 BC to the Lydians. Rather than green, this type of gold appears yellow-green. Enamels that have been fired adhere better to green gold. Whether you are looking for rings, bracelets or watches, 5 Shades of Gold Jewelry, Gray and Sons is the place to find the fine jewelry piece you are looking for. Take time to determine exactly what kind of jewelry you are looking for. To buy the perfect pieces, Gray and Sons will be more than happy to assist you with an important purchase such as this. A city in Florida, Hallandale was named after Luther Halland, and is known as the Gulfstream Park home. The World Classic is hosted by the Mardi Gras Casino greyhound racing track in the area. Recently, Hallandale has become one of the fastest growing Metro Miami and Broward County populations. While in the area of Hallandale, you might want to sell some of your own jewelry pieces from your own personal collection. When undertaking something as personal and important as this, it is of utmost importance that you find a reputable jewelry well-versed in this endeavor. This is where Gray and Sons come in. Where else will you find a jewelry expert with over thirty years of experience? Plus, with all the valid safety concerns these days, finding a safe, secure jewelry dealer ought to be your number one priority. Gold jewelry in Hallandale will come in the five shades mentioned above. As a matter of fact, regardless of whether you are looking for rings, bracelets, earrings or a necklace for yourself or for someone special, finding authentic gold jewelry in Hallandale at the expert hands of Gray and Sons may help you bring home a piece to your special someone that will be cherished forever. The number one priority that you should consider should be finding experts that have been in the business for three decades. This way, you can be assured that the gold jewelry you are interested in is not just authentic but stunning as well. 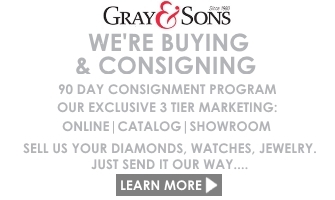 As a matter of fact you may even want to consider selling your own pieces to Gray and Sons. In this case, make sure that the person doing the assessment of the value of your jewelry is fair with returning clients and customers that are more than happy to share good experiences. 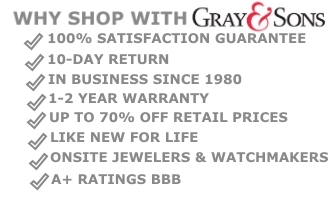 Where else but in Gray and Sons Hallandale can you be assured of timely service that is both safe and reliable. Get true value for money when you sell your jewelry in Hallandale. After all, this is one company that realizes the true value of a satisfied client that comes back for more business in the future.